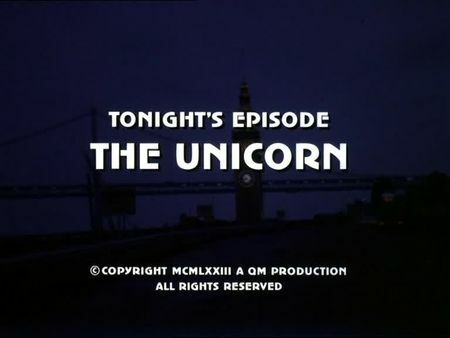 I have added the screencaps for The Unicorn to the episodes' page. When a nightly robbery attempt of an Asian ship on the docks goes wrong and leads to a wild gunfight between two police officers and two strangers, a longshoreman is killed, along with one of the policemen, and another one is wounded, still holding on the shipment box - supposedly full of cobra venom to be used in research. The wounded man is hiding out on the docks between ships and buildings, with the gun and the case, believing he has actually stolen a shipment of much greater value. He meets secretly with a priest, Father Joe, and refuses to turn himself in. Meanwhile, Mike and Steve have traced the killed crook to a Las Vegas Mafia unit in San Francisco, and learn on their own that hired killers of the Mob are coming in to find the longshoreman and finish the theft - which turns out to be a multimillion-dollar shipment of heroin. Father Joe turns to Mike Stone, asking for help and medical materials for "one of his men", but refuses to reveal where to find the wounded man. This episode was primarily filmed along the waterfront between Ferry Terminal and Pier 70. In the opening scene, Father Joe helps one of his men who tanked up on Ferry Plaza, whereas the gun shooting and the explosion of the foodtruck take place at the Embarcadero, between Piers 36 and 38. The wounded longshoreman is hiding out between ships and parts in the Central Basin (you can see the Bay Bridge in background to the north, and famous former ship building Pier 70 to the south). By the way, this place is exactly the same as used for Reid Bradshaw's boat building company in the preceding episode Shattered Image (there is that typical "Boats, Beers & Bait" shop in the background). Other locations include the heart of Japan Town, where the mobsters pick-up Dr. Jason at Post and Buchanan Streets, as well as the famous parapet of Sutro Heights Park, where Dr. Jason is released.